OUR TOWN. A Play in Three Acts. 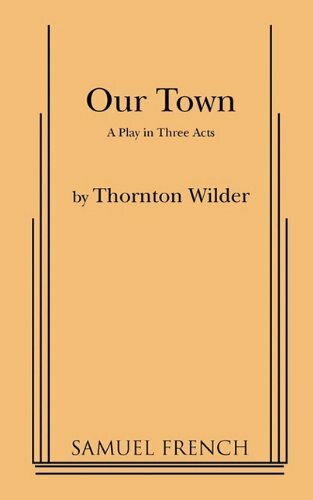 Our Town, A Play in Three Acts was written by Thornton Wilder. 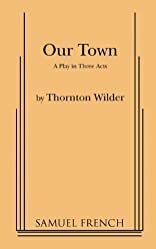 Our Town, A Play in Three Acts was published by Samuel French, Inc.
About Thornton Wilder (Author) : Thornton Wilder is a published author of children's books and young adult books. Some of the published credits of Thornton Wilder include The Bridge of San Luis Rey (Unabridged), Our Town. I've heard many people refer to Our Town as "an old chestnut" which they feel has no business being read or performed anymore. This is another book I read at least once a year to settle the mind and re-align perspective. It's a simple story but it's the story of all of us, it's the story of what it's like to live and age and experience loss and death. And it even touches on what may await us on the other side. A lovely work which definitely rewards one's time.